The World Nuclear Exhibition (WNE) has only celebrated its second edition and yet, it has already become a well-known reference in the energy community. Hosted every two years at le Bourget, near Paris, this edition has managed to attract the interest of approximately 9000 participants, among which 14% considered to be senior decision-makers. The event gathered 678 exhibitors from 27 countries to showcase their contribution to the energy sector and through a series of talks gave them the opportunity to present their latest projects. It is a meeting point where policy-makers unveil new strategies, business deals are being signed and intense networking is unfolding. The ITER project was also present to demonstrate its contribution to the big energy players in several ways. 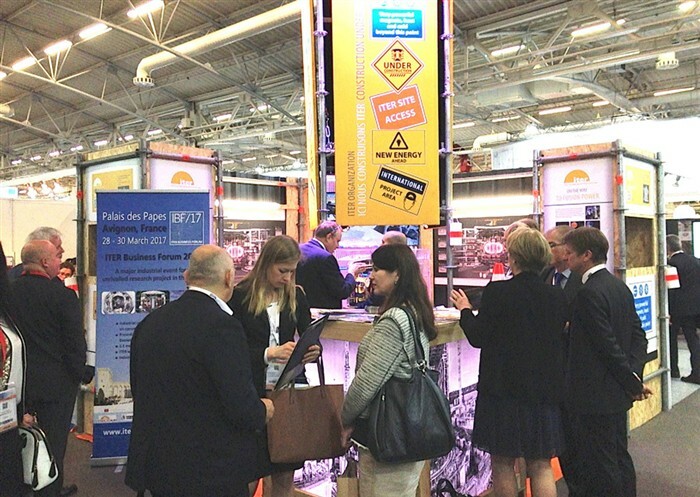 First, ITER’s centrally located exhibition stand caught the attention of many participants and helped them to find out more about the progress of the largest fusion facility. Second, ITER International Organization announced the signature of a contract for EUR 174 million for the Construction Management-as-Agent with the MOMENTUM joint venture, led by Amec Foster Wheeler in partnership with Assystem and KEPCO Engineering and Construction. Third, F4E together with Assystem reported on the progress of ITER and the complexities that underpin it. Graham Strickleton, F4E Contracts and Procurement, and Hubert Labourdette, VP Strategic Operations Assystem, kicked off their presentation by giving the audience a summary of the ITER project and then focused on the civil engineering and construction. F4E is responsible for 39 of the buildings and facilities on the ITER site. Assystem, is part of the Engage consortium, consisting also of Iosis, Atkins and Empresarios Agrupados. The consortium has been awarded six years ago the Architect Engineer contract, considered as one of the biggest civil engineering deals in Europe. In their view, a large international project like ITER requires a high level of commitment from all parties; a collaborative spirit among all partners and sufficient delegation of responsibility; flexibility and creative thinking to tackle unforeseen factors; an integrated team to offer a pool of resources in order to select the best profile for the different tasks; a strong project culture to manage schedules and delivery. Last but not least, the joint presentation by F4E and Assystem, transmitted a subtle, albeit clear message: ITER is about creating teams and capitalising on their talent and potential.